It's early in the wee hours of the morning when a lonely farmer loads up his truck with his goods to sell. He lives far from the city and if he wants to ensure a good spot at the bazaar, he will need to leave with haste. The road is long and dull, the farmer sees but a single car driving in the other direction in the early morning mist during the first half an hour. After an hour has passed, the farmer looks out the window and sees the house of an old friend of his and notes to himself, almost as if to calm his own nerves: "I've already covered more than half of the way to the city. Surely I will make good sales today." The day is hot and winding as the farmer calls people out to buy his goods. At long last when the sun has set, the farmer packs what little remains of his cargo and starts to travel back home. Lighthearted and in good mood, he can barely notice the time passing until he sees his friend's house again, saying to himself, "Oh my, I've already covered more than half the way! Surely I can get home early today." The farmer drove with the same speed both in the morning and in the evening. How is it possible that he had passed more than half the way on both times when reaching his friend's house? This is a short and simple solution and seems to match everything stated in the puzzle. It's because the farmer drove along different roads. The road was two-way for the first half an hour, then became one-way. 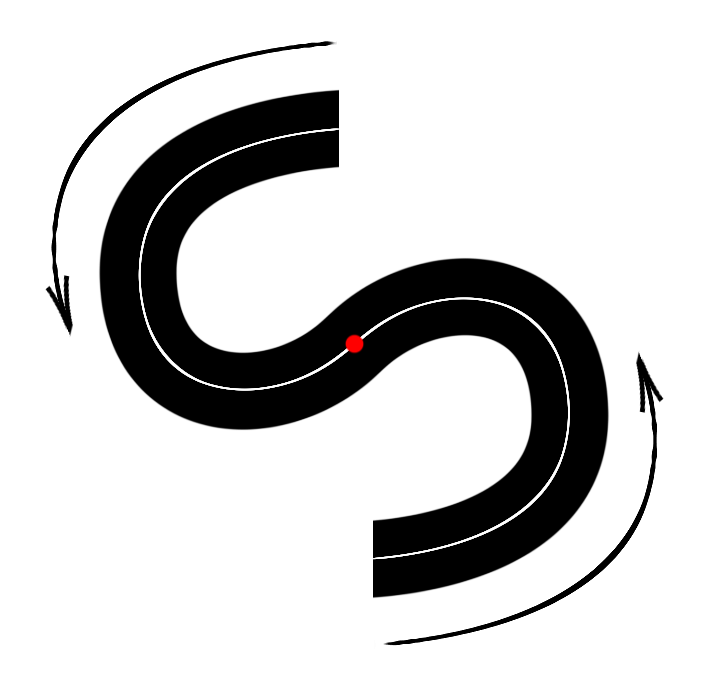 In the picture, the red color represents the morning road, the blue color shows the evening road. The green box is his friend's house. The friend's house is at the red dot, it doesn't really matter at which side of the road. The traffic in the below image is right-handed, if it was left-handed, just flip the image. Because the bazaar was not in the city he referred to the first time he passed his friend's house. The bazaar is beyond the city. You want us to assume that the bazaar is in the city, but you never explicitly say it is. He started further away than his house at the start of the day. Suppose he lives on a large farm, and his goods are stored at the far end of the farm, whereas the house is at the end closest to the city. 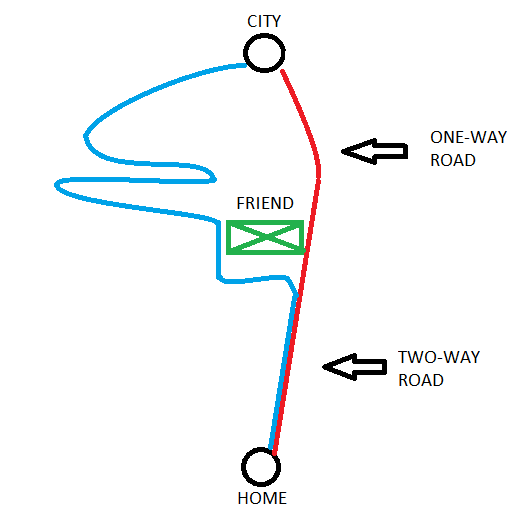 Now, if the friend's house is just a little short of half way between his house and the city (as viewed from his house), then starting from his storage, his friend's house is a little over half way to the city. On the way home, his friend's house is a little over half way to his house. Between the friend's house and his own house is a weight-limited bridge (or even a height-limited tunnel). For example, the route avoiding the bridge is 100 km from home to his friend's, and from his friend's home to the city is 80 km. However, after selling all his goods at market to make his vehicle lighter (or less tall), he can take the weight-limited bridge, cutting the distance from his friend's to home to 50 km. Due to the morning mist, the bridge is closed to traffic, regardless of vehicle weight, so he has to take a detour. The long road is dull because it is lined by identical houses exactly 1 mile apart, that is, except for the friend's house whose neighbours are 2 miles away in each direction. So Mr Farmer doesn't recognize his friend's house until he has driven 1 mile past it. Because his friend lives in a van/car, and has moved during the day. Perhaps he came from the city to cheat on the farmer with his wife, while he was away. So they basically met at different spots each time. First time closer to the city, second time closer to the farm. Not the answer you're looking for? Browse other questions tagged logical-deduction story situation or ask your own question.